Belgium and England played a strange game Thursday in their final match of the World Cup group stage. Both teams were set to advance out of Group G, but it was the loser of the game that would get placed in the weaker side of the knockout round bracket. So, both teams played knowing that a loss is kind of a win. Then there was a brilliant moment following the only goal of the game. After Adnan Januzaj scored what would be the game-winner for Belgium, teammate Michy Batshuayi went full Three Stooges in his celebration. You never want to go full Three Stooges. He picked up the ball and tried to kick it into the net. It went poorly. He wound up kicking the ball into his own face. 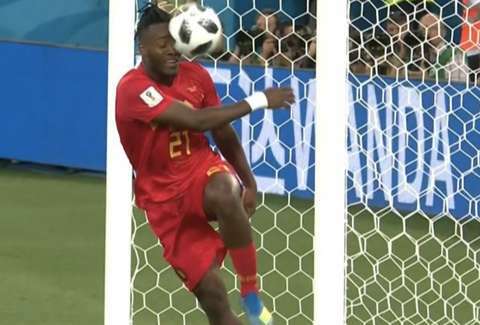 Batshuayi's mishap was perhaps not only the highlight of the game but one of the weirdest moments of the World Cup so far. At least, that's the sentiment of many on social media who were having a laugh about Batshuayi getting owned by the goal. The whole situation got even better after the game because Batshuayi hopped on Twitter to laugh about the incident as well. Fortunately, Batshuayi has a little time to rest his face before the next game. Belgium will start the knockout stage on July 2 against Japan. If they win, they'll face the winner of Mexico and Brazil.